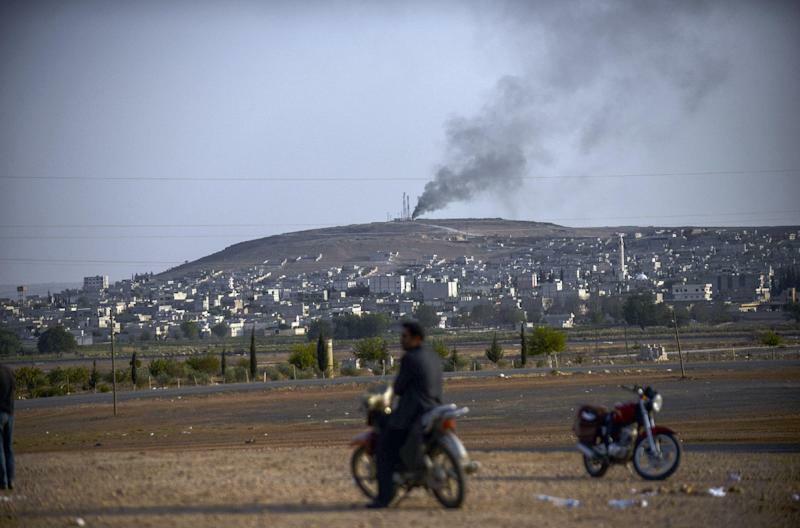 Mursitpinar (Turkey) (AFP) - White smoke billows over the town of Kobane in Syria and the crash of mortar shells is clearly audible -- the intensity of the battle for the Kurdish town is tangible from the Turkish side of the border. 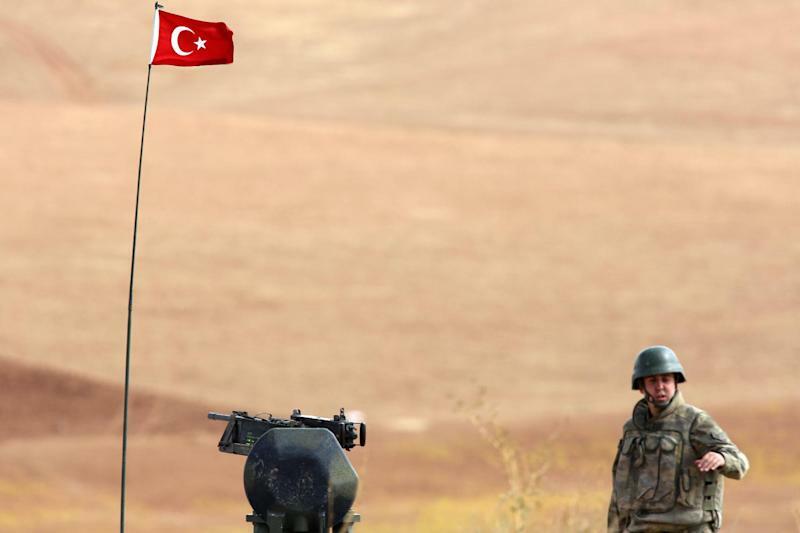 Yet Turkish Kurds watching the fighting between Kurds and Islamic State (IS) jihadists on the other side of the border have little faith an authorisation for military action from Turkey's parliament will translate into concrete action. Even with occasional stray shells landing in Turkish territory, the Kurds angrily accuse Ankara of doing next to nothing to combat the IS militants. "The Turkish state has declared its hostility to the Kurds with its reluctance. We no longer have confidence in Turkey. We will fend for ourselves," said Turkish Kurd Burhan Atmaca, 54, as he surveyed the scene from the border. Turkey's parliament on Thursday authorised military action against IS, and Prime Minister Ahmet Davutoglu sought to reassure the Kurds that the government would do everything in its power to prevent Kobane, known as Ain al-Arab in Arabic, falling to IS. But it has yet to outline any plans for military action and many Kurds fear the Turkish government is more interested in undermining Kurdish separatists than dealing with the IS threat. "The Turkish army has no thought of an operation against IS fighters. The motion will remain on paper," said Turkish Kurd Nurettin Bayik, 40, as others surveyed the battle scene with binoculars. Turkey has played an ambiguous role in neighbouring Syria since the civil war began there in 2012, accused of backing militant Sunnis who it hoped would topple the regime of President Bashar al-Assad. Even as the IS threat grew, Ankara continued to play a low-key role out of concern for a group of Turkish hostages captured by the jihadist group in Iraq in June. The hostages were released in late September, but some analysts suspect Ankara is now also concerned about Kurdish separatism, having fought a 30-year insurgency by the Kurdistan Workers Party (PKK) in Turkey's southeast. The jailed head of the PKK Abdullah Ocalan said this week that the conflict with IS had the potential to derail the fragile peace accord signed with the Turkish government last year. Turkey has been hugely reluctant to allow Kurds over the border to fight IS, apparently fearing they will team up with Syrian Kurds to develop a large fighting force on Turkey's border. But locals fear no one else will do the job. "We have no faith in the government," said Cafer Seven, 48. "In the past, Turkey activated its rules of engagement whenever a single PKK bullet fell on its soil. But it remains a bystander when mortars fired by IS are hitting Turkish territory." The Kurds are seen as the world's largest stateless people, spread between Turkey, Syria, Iran and Iraq after missing out on a state of their own when borders were redrawn after World War I. 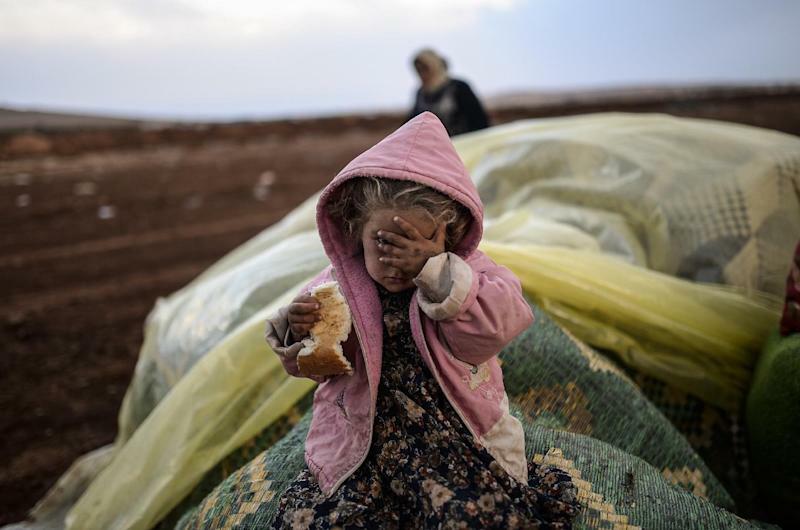 For the Turkish Kurds on the border, the fall of Kobane would be as traumatic as the fall of a city inside Turkey. "There is no border in our brains, nor in our hearts. To us, Kobane is Diyarbakir," said Serafettin Dede, referring to the main Kurdish city of southeast Turkey. "We are one people and we are all Kurds," added Salih Celik, 50. "If Kobane falls today, Kurds will also fall." Hundreds of Kurds from across southeast Turkey have come to the border area, holding a round-the-clock vigil and urging greater action to save Kobane. "The world and Turkey remain silent in the face of this tragedy," said Mulkiye Asurbayef, a teacher who left her two children back in nearby Mardin province to join the protest. "We will not abandon this protest until the bloodshed stops and the IS monsters are defeated, no matter how long it lasts." One refugee, Huseyin Hillac, from Kobane said the Kurds themselves would ensure the city does not fall. "We will not yield even if the (fighting) lasts for a year. Our comrades will resist until the last drop of blood."